Hey, another VMworld is almost upon us. I am fortunate enough to be talking again this year. Below you’ll find the information about my sessions. Be sure to register if you are interested in attending. 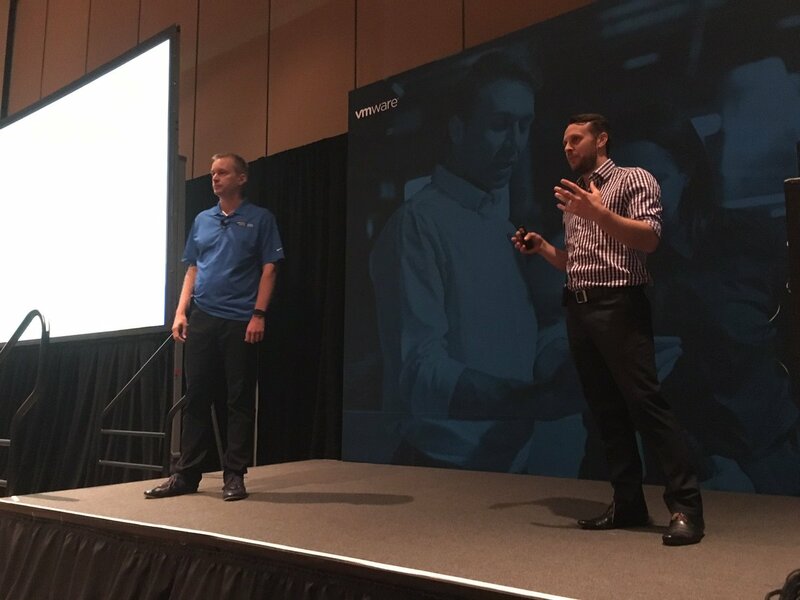 Get your questions answered on deploying Horizon 7.1 on VMware Cloud Foundation. Chat with Cloud Foundation expert Todd Simmons and Horizon expert Simon Long. Group discussions are a great way to join together with peers, guided by VMware experts, and discuss a VMware key topic. Come to this session prepared to dive in, engage, and share best practices. “How does VMware architect its own global VMware Horizon desktop environment?” “Has it encountered the same obstacles we are facing?” Over the past two years, VMware has been re-architecting and re-deploying its virtual desktop infrastructure with VMware Horizon, VMware App Volumes, and VMware User Environment Manager running on top of the full VMware software-defined data center stack (VMware vSphere, VMware vSAN, VMware NSX) and integrating with VMware vRealize Operations Manager and VMware vRealize Log Insight. In this session, the lead architects will reveal all. There are so many awesome people in our vCommunity who are afraid of public speaking and think they would not be good at it or would not have anything to share. This session showcases 4 different members of the vCommunity: Edward Haletky, veteran book author, podcaster, blogger and renowned vSphere security expert; Simon Long, double VCDX at VMware; Ariel Sanchez, vCommunity addict who works as TAM for VMware in Pittsburgh, and Thom Greene, ruler supreme. All of them will give you their best tips to help you be great at public speaking NOTE: Community TechTalk taking place in VMvillage. A major focus for VMware Cloud Foundation is the automation of the deployment and maintenance of the backend infrastructure for the VMware Horizon virtual desktop infrastructure (VDI). This session covers the built-in automation of the deployment of VMware vSphere, VMware NSX, VMware vSAN, VMware vRealize, and VMware Horizon components that VMware Cloud Foundation offers. It will also describe the integration of VMware App Volumes in this infrastructure and the ability to dynamically build this infrastructure with the growth of your desktops, resulting in turnkey VDI deployment. All you need to bring are the desktop images.